The USS CAPE COD (AD-43), a Yellowstone-class destroyer tender, was commissioned on 17 APR 1982. 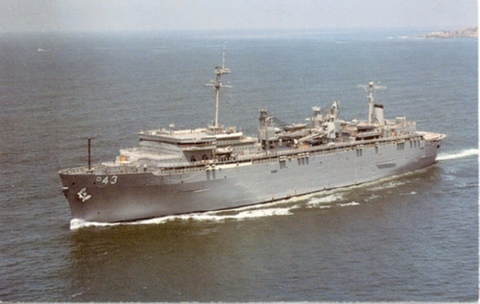 USS CAPE COD served her country for 13 years, 5 months and 12 days, until decommissioned on 29 SEP 1995. USS CAPE COD was designed with the capabilities to maintain and repair the gas turbine powered FFGs, DDs and DDGs. After commissioning and sorting out, CAPE COD made her first Western Pacific deployment in 1983. Regular deployments followed, some extending into the Indian Ocean, alternating with tending the fleet while in her homeport of San Diego. The draw down of the US Navy in the early 1990s, and a change in the composition of the fleet, left CAPE COD without work. USS CAPE COD was decommissioned in September 1995 and moved to the Naval Inactive Ship Maintenance Facility at Ft. Eustice, VA, where she awaits disposal.